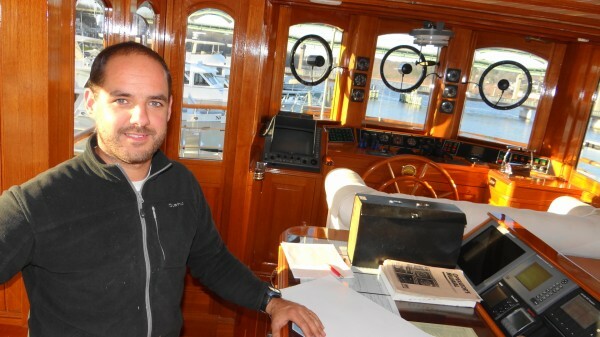 Andreu Balcells in the wheelhouse of the Atlantide, a 122-foot motor yacht that once rescued Allied troops from Dunkirk, France during World War II. Balcells is overseeing the vessel's visit to Belfast's Front Street Shipyard, where it is undergoing work. The stern of the Atlantide. 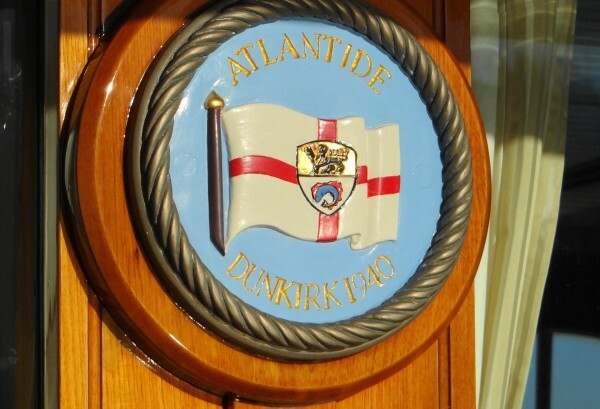 A sign on the Atlantide, a 122-foot motor yacht, notes that the vessel rescued Allied troops from Dunkirk, France during World War II. The yacht is undergoing work in Belfast's Front Street Shipyard. 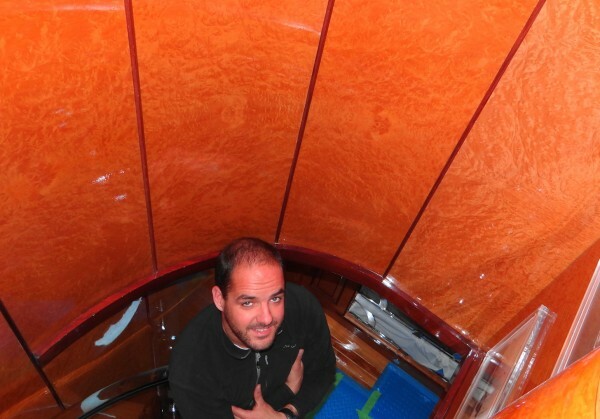 Andreu Balcells, captain of the Atlantide, stands in the wood-lined circular stair that leads from the deck to the wheelhouse. The bow of the Atlantide. 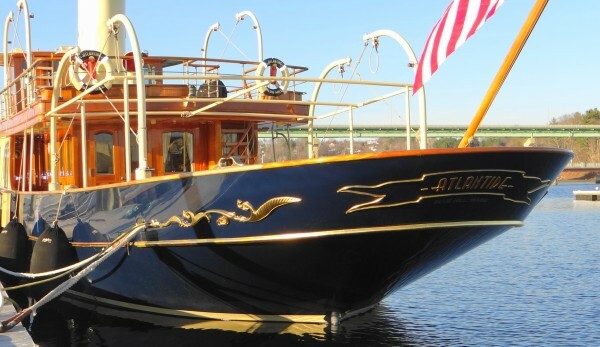 BELFAST, Maine — Stunningly beautiful and opulently outfitted yachts have become a staple of the harbor these days, as the Front Street Shipyard continues to thrive in providing services for luxury vessels that call here from around the world. But the Atlantide, which will get hauled out for some work on Monday, is a little different. 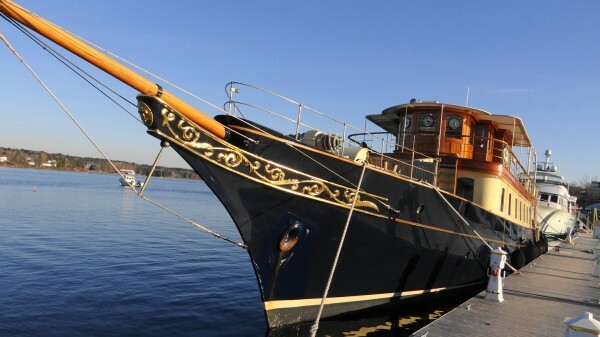 The 122-foot steel-hulled motor yacht has all the elements of luxury, but the vessel has earned the TLC it has coming, having played a life-saving role in the World War II evacuation of Allied troops pinned down at Dunkirk, France, by the invading German army. In 1939, the boat was pressed into service by the British Royal Navy, and the following year joined a fleet of private and navy boats of all sizes and kinds that crossed the English Channel to rescue British and French troops from Dunkirk. Today, it’s difficult to imagine tired, frightened troops hunkering down below decks on the boat as shells exploded nearby. A major retrofit was undertaken in 1999 by then-owner Tom Perkins. Perkins is well-known in yachting circles as owner of the Maltese Falcon, a $130 million boat he conceived and had built as his dream boat. Atlantide was listed for sale by Perkins at 5 million euros earlier this year. Andreu Balcells, the vessel’s captain, caretaker, watchman and engineer, employed by owner Richard Fairbanks, gave an abbreviated tour of the boat this week. Gleaming wood abounds, though the finer amenities in the two elegant staterooms, the saloon, dining room and spa bathroom are under wraps, as preparations are made for the shipyard to pull the boat out of the water for work. The vessel’s 8-cylinder diesel engine lets the Atlantide cruise easily at 10 knots per hour, Balcells said, yet the vessel also is equipped with two masts. In her travels across the Atlantic, the sails help keep the boat stable, he explained. Since 1999, the boat has logged 104,000 miles, Balcells said, traveling to Russia, Panama, the Caribbean, Panama and Canada. Balcells has been with the boat for a year, arriving in Belfast this month on his first U.S. visit. New owner Fairbanks, who owns a house in Blue Hill, plans to stay local, Balcells said, and has downsized the crew, aiming to enjoy Atlantide with family, cruising around the Maine coast.